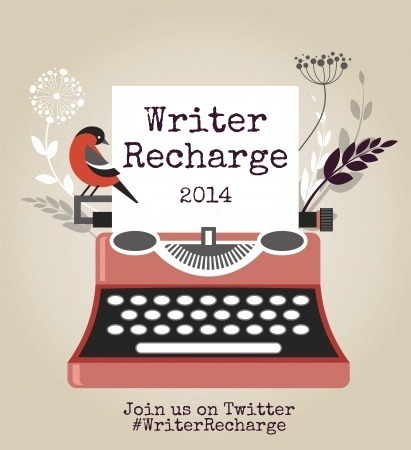 Join us for a month of #WriterRecharge! We thought our writer friends might be in need of a little boost. A jump start, if you will. A recharge. We’d like to invite you to join us for Writer Recharge 2014, a month-long motivational challenge similar to last summer’s Ready. Set. Write! So many of us benefited from setting goals, connecting with other writers, and social media-based accountability. So, hey, let’s do it again! Whether you’re delighting next to the crackling fireplace of a Shiny New Idea with a warm cup of tea and a sleepy puppy at your feet or spinning out on the ice-covered roads of revisions in an attempt to avoid the snow-packed ditch, we want to write with you! What do you want to accomplish this month? Hit a daily word count? Revise a certain number of pages or chapters each week? Complete a draft by the end of the month? Let’s get this party started! Every Monday in February: Update your progress via your blog or twitter. Link your blog posts at Sara’s Monday posts. February 28: Post your final update via your blog or twitter. Anyone who uses the hashtag or links their blog posts will be entered to win one of 5 query or 3-chapter critiques. Sound easy enough? Set your goals and get started! We’ll see YOU at #WriterRecharge. My goals for the month? Write 10 000 of a new YA contemporary romance (companion of ONE TWO THREE) called ALWAYS SECOND BEST (I need to update my projects’ page very soon). Next postALIENATED Launch & NOOK Giveaway! Ahhhhh, thank you for putting this together. I REALLY need this! Will be joining you all, but in the meantime, wow, you have super-impressive goals, my friend! You can do it! Thanks Kip 🙂 Glad you’ll be joining us! Ooh, I love the title of ONE TWO THREE’s companion story. Best of luck getting a strong start to it! Looking forward to being all kinds of productive with you this month, friend! I too love the companion novel’s title! And yay for revising buddies and motivation! So excited! Awesome goals, Elodie! I think February will be a very productive month for all of us. I really love these writing events you all organise. So motivating and handy for keeping track of goals! Hahah! :) I like to see another person’s writing schedule looks like mine. However, I am not able to stick to it like I did when I was in my old place. But I think we need a schedule to work. Mine currently is: Finish reading a book for a book review (overdue); finish contest piece due on Deb. 28th with a $25.00 reading fee; finish first draft of novel. Just those three things this time. Normally it is five but those three are enough. I am also checking to see if a magazine article is showing on a website that I did. Hopefully with a nice cup of tea or something I will finish some more writing. So excited for this month and all the “fun” we’ll be having as we work through our goals. Best of luck – I’m behind you all the way! 🙂 Thanks for joining in on this! I love fitness goals coupled with writing goals!! We need both! Well, I do haha. Good luck!! Good luck with your goals! I don’t know what Always Second Best is about, but I can’t help but to feel some sympathy for someone who is “always second best,” if that’s who your main protagonist is. those are great, well-rounded goals. You can do it! Count me in! This is exactly what I need right now. Putting together my post now. Yay! I need to write five days a week too, to make any headway. But thanks to this challenge, #writerrecharge may just do it! happy writing!